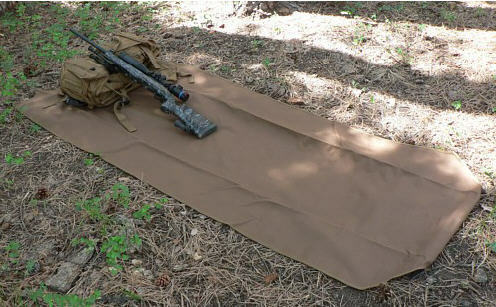 Eberlestock Non-Padded shooting mat is a simple and effective tool that the professional shooter will appreciate. Carry it rolled up, and when it's time to set up a shooting station, you simply hold the end and toss the mat out. With its weighted end, it unfurls and you're ready to go. It's long enough to cover the distance from below your knees to well in front of your barrel, so it is an effective muzzle blast dust suppression barrier. PVC backing makes it waterproof. The non-padded Shooting Mat is very compact when rolled up. Approximate weight is 1 Pound 14 OZ.